I was first introduced to traditional Afghan costume by a friend at university. She came to a ladies' event in the most colourful and intricate ensemble I'd ever seen. Purples, greens, reds, silver, all worked into a (very hijab friendly) long-sleeved dress with matching shalwar bottoms - and all this from the country most associated with burqas. It's a shame that more people aren't aware of how beautiful traditional Afghan garments are. At the end of this post are some photos, although I'm not yet familiar with the regional differences in the costumes. The modern Afghan fashion scene may not be as developed as that of other Muslim countries such as the UAE and Turkey, but a handful of designers are slowly emerging. Zolaykha launched her own company, Zarif Design in 2004. It aims to preserve traditional Afghan art and design, whilst also providing local women with training and employment opportunities. Visit the website to read more about the other philanthropic projects that Zolaykha is involved with. Similarly, Tarsian and Blinkley, founded by Sarah Takesh, also seeks to improve the lives of Afghan women by providing them with educational and employment opportunities. Their garments are all hand-embroidered by local women, who are encouraged to come up with their own designs. Sara Rahmani is another entrepreneur who set up her own company, Sara Afghan which you can read more about here. So far from being a frivolous pursuit, it appears that fashion in Afghanistan has taken it's own distinctive path, namely preserving the country's heritage and helping it's most vulnerable citizens at the same time. But traditional Afghan costume has also influenced foreign designers. These photos are from a collection presented by Elizabeth Muir at Miami Fashion Week in April 2008. You can read more about what inspired her designs here. Afghan traditional cloths are really beutiful , my afghan cloths are like the girl with red scarf but in red colour with green scarf and shalwar. I had no idea that Afghan traditional clothes were so pretty. I would definitely wear something so pretty and colorful. Mashallah, the colors and ensembles are lovely. 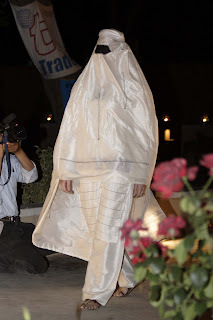 Although, the all white with dark eye cover burkha was kind of creepy. I have appreciated quite a few niqaabi outfits and burkhas... it's just so very casper/ghost meets burkha. In fact, a friend from school wears a white niqaab with various earth tone jilbayas... and I love it. That one is a bit, unsettling to me. Everything else is just gorgeous. 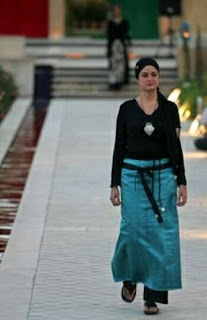 It's wonderful to see sisters in design who help preserve and even spread their culture within the realm of designers. Thanks as always for the great posts. "Yes, there is more to it than blue tents..."
lol, anon, I wouldn't call it lack of tact, I'd say that's what many people were thinking anyway! 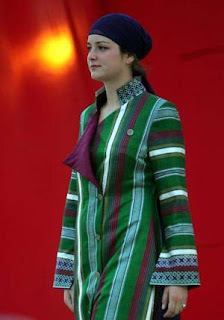 Lovely post, did anyone see what the afghan women were wearing at the Olympics opening ceremony, it was just beautiful! This is anon 2: I know that's what some people think, but you don't have to say it out loud- that's why I said there was a lack of tact! (It's probably best not to think it in the first place, but that's not the issue). That is really beautiful. I love the bit of Russian influence. Really gorgeous. Jessyz, it comes as a surprise to many people. I'd love to have some of my own too! Aisha, I agree, I'm not too fond of it myself. Anon 2, excuse me? What the heck is up with some of the anon commentors here? Who are you to tell me what I should or should not write on MY blog? For your information, I have a lot of non-Muslims who read this blog, and my posts are often linked from media sources. 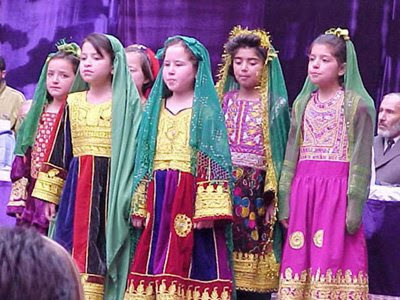 Chances are, if you're not familiar with Afghan culture, then most likely you ARE under the impression that all Afghan women's clothing consists of is the things that were enforced on them by the Taliban. Which strangely enough do resemble tents - get over it. Perhaps you should complain to them about their 'lack of tact' in abuse of basic human rights? I am just surprised that of all the things you find to comment on, you had to nitpick about one sentence, which obviously nobody else had a problem with..
Jaime, indeed. There are so many different ethnic groups in Afghanistan, each seems to bring it's own unique touch with regards to the designs. I'd love to be able to differentiate between them! Masha Allah! Afghan traditional wear is beautiful. picture with the green veil and the red dress looks soo cute! they r not exactly the same but the ones on the website r some of the new styles. WOW! The colors are seriously inspiring! This is what I'm trying to do for the colder months: wear more bright colors instead of going with all the dark, dull shades that are everywhere. Being from South Asia myself, these photos show what I really miss about that part of the world: the gorgeous colors people wear, from their everyday clothes to party attire. I'm convinced we need more color in western fashion. It does so much to brighten the day and lift up the spirit. Applause for the educational post and lovely photos! WOW!! There is truly more to the Islamic Afghan fashion industry than long blue burqas. Quite similar to Pakistani styles. Lurve it!! Thanks for an informative post!JazakAllah Khair. Check out Samira Atash. She was one of the first Afghan-American designer to go to Kabul a few years ago. Her site has fashionable stuff inspired by Afghanistan...gorgeous! um.. just like to clarify, afghans AREN'T south asians, they are central asians! I know of this website called http://www.afgclassics.com they have wonderful clothes from Afghanistan!! Check there website and see for yourself! They have the LARGEST SELECTION of AFGHAN CLOTHES that I've seen!! 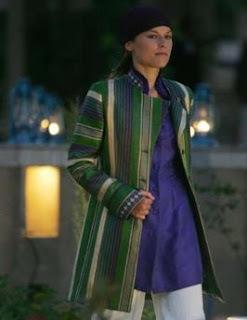 Traditional Afghan Clothing sold online...you cant go wrong!! I just visited www.afgclassics.com and you are right they have beautiful clothes. I just ordered 2 outfits for my brothers engagement and wedding that is coming up. It was so easy to order! Thanks for a great post. I agree wholeheartedly with you openly raising the issue of the "blue tents" as this is what so many people in other places associate with Afg. I've just spent a couple of months in Kabul, then come back home to Australia, and this is THE no. 1 question: "Do all the women wear burkhas" or a variation thereof. So I try to explain just how varied women's dress is in Kabul--from traditional garments to very funky coats, jeans and high heels--gorgeous! I'm so glad you addressed this head-on. They have the newest styles of Afghan Clothing from Afghanistan.